This mouse line expresses the reverse tetracycline transactivator (rtTA) under control of the Ptf1a gene. It can be used to activate expression of TetO-regulated genes in sites where PTF1a is expressed, such as pancreatic acinar cells. This figure shows how this line of mice was made. Coding sequences for the reverse tetracycline transactivator (rtTA) were inserted into an exchange cassette that allowed RMCE into a Ptf1a[LCA] allele. 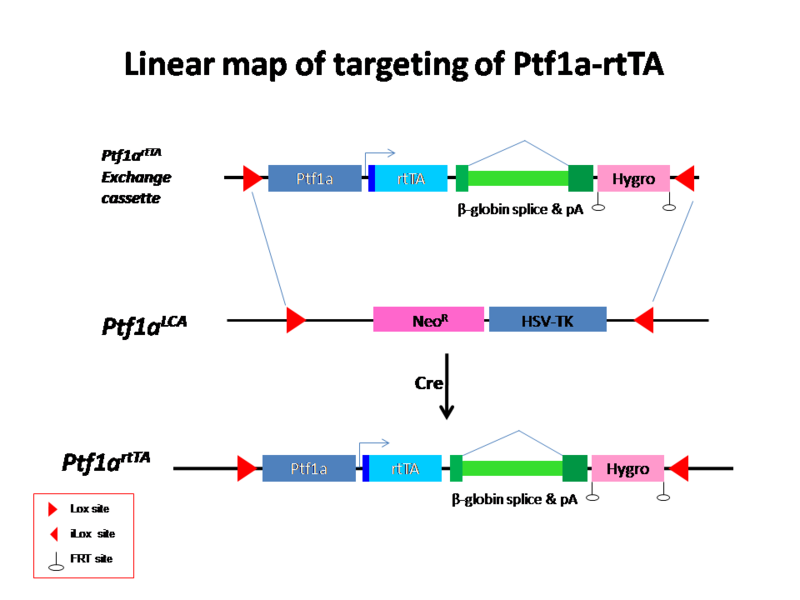 In this manner, rtTA is expressed under control of the endogenous Ptf1a promoter. The exchange plasmid also contains a 51bp translational enhancer (5' leader sequence from Xenopus beta-globin gene), a Kozak sequence upstream of the start condon, and intronic and polyA sequences from the rabbit beta-globin gene that confer stability to the mRNA. The hygromycin resistence cassette, necessary for RMCE, was removed by intercrossing the FlpE-expressing mice then segregating the two alleles.